If you still have room on your shelf after all of the other countless versions of Monopoly, check out this new board game based on the popular video game Fortnite. 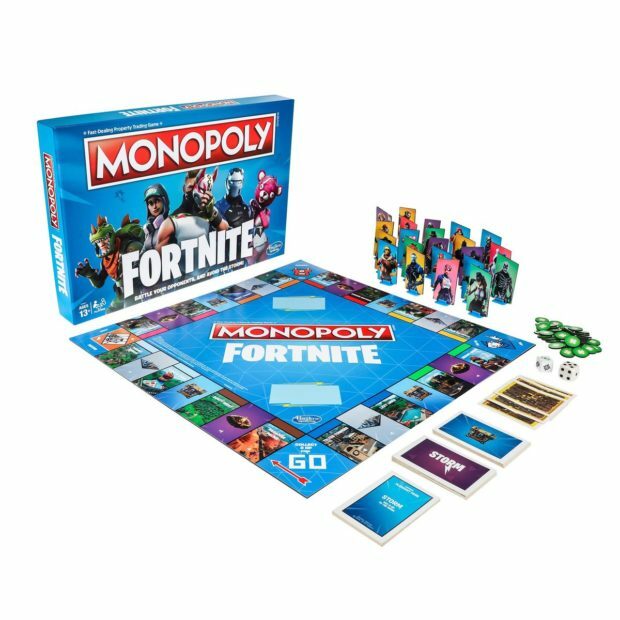 That’s right, Fortnite Monopoly – the game you will never play because you are too busy playing Fortnite. This version of the classic board game replaces the usual property trading with elements from the popular shooter. Naturally, island locations replace the buildings. For instance, Tilted Towers is the new Boardwalk. You’ll also spot Paradise Palms, Dusty Divot, and Lazy Link. Forget money, health points are the currency here. This isn’t just a Fortnite theme, there are actual changes to the game mechanics. Fortnite’s storm will play a big part in the game as storm-struck locations will take two lives each. The dice will also be split into movement and action rolls, so you can shoot a rival or defend yourself before you move. I have to admit this sounds like a better version of Monopoly compared to some of the others that Hasbro has released. The game will hit stores on October 1st. If you can break yourself away from the video game long enough, you can give this board game a chance on that date. But can you really stop playing long enough to play another version of it? We will see.